The United States Marine Corps is responsible for providing force projection from the sea, using the mobility of the U.S. Navy to rapidly deliver combined-arms task forces inot combat situations. Although the US Marines fall within the Department of the Navy, and often works closely with the US Navy for training, transportation, and logistic purposes, it operates as a separate branch of the military. Originally organized as the Continental Marines in 1775 as a naval infantry, the US Marine Corps has served in every American armed conflict including the Revolutionary War. Its ability to respond rapidly to regional crises has made it an important body in the implementation and execution of American foreign policy. 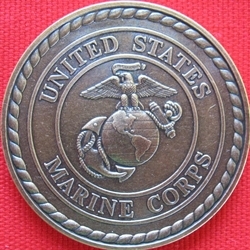 This coin honors the commitment of the United States Marine Corps to respond rapidly with its practice of ambitious warfare to crisis situations at home and abroad in the defense of America's global interests.